The Timau route, the main access route on the north side of the mountain, lies in a major rain shadow. Because of this there is a very little forest on this side of the mountain. However since you are inside a low rainfall zone it generally makes for a drier safari and a more pleasant trek. 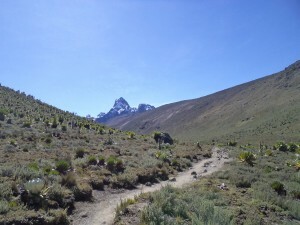 The slope is gentle and because the peaks on Mount Kenya line up east to west the views from the north give you the impression you are trekking into a whole mountain range. Morning spent organizing and sorting equipment for your trek to Pt. Lenana (16,355 ft.), the third highest peak of Mt. Kenya. Lunch at the lodge (this is an extra charge for those not on full board the previous night). In the afternoon, you will be transported to the Timau road head where you will begin your trek up Mt. Kenya from the north. (Overnight in high altitude mountains tents – Timau road head). Hiking across beautiful northern moorland of Mt. Kenya with its unique flora and possibly seeing some of the wildlife which wander up those northern slopes – zebra, eland, etc. Camp near the Western Marania River. Continue your trek over rolling moorland country to camp at the headwaters of the Kathita East drainage. Hike up to the spectacular Hall Tarns where the beautiful rock formation known as the Temple stands guard over Lake Michelson 1000 vertical feet below. Penetrate the defenses of the Temple and descend to Lake Michelson. Truly a trekker’s paradise. An early start to ensure a successful summit bid for our main objective Pt. Lenana (16,355 ft.) Descend to MacKinders Camp on the Naro Moru Track. Descend the mountain via the Naro Moru Route completing a fine circuit of Mt. Kenya, to the Naro Moru River Lodge for a well-earned rest/ other destination.